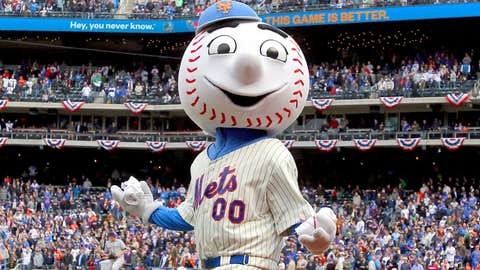 Mr. Met is getting antsy for the ballpark to be full of fans, again. … especially with words like “snow,” “wind-chill factor” and “polar vortex” appearing in weather forecasts. Pitchers and catchers will start reporting to their spring training sites in Arizona and Florida before you know it — and exhibitions games start on Feb. 25. But until then … well, we’ll just have to get by. The New York mascot made the best of the conditions on Wednesday afternoon at Citi Field, the Mets’ home ballpark. However, it’s not all fun and games. Mr. Met isn’t afraid to put in the work, either. Maybe, this is the secret to his charm with the ladies. Mr. Met wasn’t the only mascot enjoying the offseason. The Philly Phanatic hit Cancun with Phillies outfielder Domonic Brown. When he wasn’t in Mexico, the Phanatic was hangin’ with a famous Philadelphian. And let’s not forget MLB’s newest mascot — who was recently seen at the annual Cubs Convention with a Hall of Famer.